Thousands of calls, hundreds of flyers, dozens of sign-ups, and multiple cities organized in just a few weeks? That’s the power of everyday people like you getting together and fighting back with Women Against King. When we talked with voters and recruited new volunteers at Clear Lake’s Independence Day parade, we knew it wasn’t just the hot weather making Steve King sweat as he marched past. King knows we’re gaining momentum throughout the district, and he’s feeling the heat. As a champion of financial de-regulation, Congressman Steve King bears some responsibility for the 2008 financial collapse our nation still struggles to recover from. Well-funded by Wall Street and corporate friends, King repeatedly voted against tighter oversight of Wall Street which could prevent the Crime of the Century from being committed again with impunity. Immigrants, King insists, must obey the letter of the law while criminals in pin-striped suits walk free. He even wants to create a national holiday for “victims of immigrant violence” yet wouldn’t vote for the Dodd-Frank Legislation aimed at curbing criminal financial abuse. King has even tried to privatize Social Security, which could have resulted in a windfall of over $275 million in fees to his Wall Street friends. 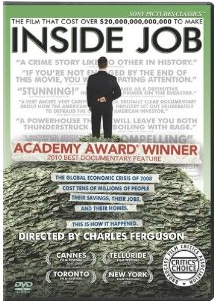 We are showing the Oscar-winning documentary “Inside Job” to help people fully understand the financial collapse of 2008 and learn how King could have helped prevent it. His refusal to hold rich and powerful criminals accountable proves, yet again, how he fails to reflect Iowa values and is unfit to represent us. This entry was posted in Calls to Action, Steve King and tagged Inside Job, Iowa's 4th District, Steve King, Take Down Steve King, Take Down Steve King Ames, Take Down Steve King Mason City, Women Against King. Bookmark the permalink. Thanks for sharing this! We’re looking forward to meeting some new folks this week and continuing to gain momentum. Feel free to give our organizer Hannah a call at 515-337-5872 if you have any questions about these events or about how you can get involved.